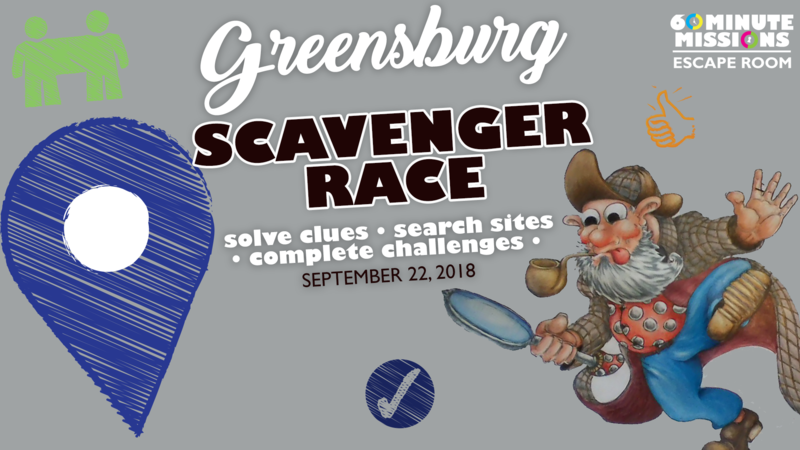 The Greensburg (GBG) Scavenger Race is a scavenger hunt and race in one – full of city exploration, mental & physical challenges and plenty of clue solving. This event is presented in partnership with Sobel’s Obscure Brewery who will be offering beer sampling to participants 21+ at various pit stops throughout the race. 1. Every participant must be registered online through 60minutemissions.com by September 17, 2018. 2. Teams may consist of 2 to 4 racers. 3. The person making the reservation will be considered the team captain and receive race updates via email. 4. Each team needs to check-in by 11:15 a.m. (15 minute after race start), or forfeit race. 5. At least one racer from each team must have a smart phone capable of taking photos/videos and an active Facebook account. 6. All racers must be at least 18 years of age, or be accompanied by a parent or guardian. 7. Teams must have a designated driver identified at time of check-in and provide proof of license, registration and insurance. 8. All racers must be willing to sign a liability waiver during check-in.